HomeResourcesWhy #HPSResearchers should be action-learning enthusiasts! Fostering a long-term partnership with health practitioners has generated a true appreciation of dedication, hard-work and the importance of researcher-practitioner engagement in manoeuvring a constant maze of systemic constraints. There have consistently been calls to bridge the gap between researchers and practitioners, the 21st century has also brought to the forefront a more pronounced focus on research uptake in #HPSR. We continue to grapple with the question of how will we actually bridge this gap and fulfil funders’ expectations of high impact tangible outcomes. Starting off as a young intern on the Resilient and Responsiveness Health System (RESYST) project, I was unsure what to expect or where this road would lead to, nonetheless the prospect of engaging directly with practitioners was exciting and still is. The RESYST governance team adopted an action-learning collaborative approach focusing on strengthening the micro-practices and processes in every-day health settings, particularly at lower levels (district, sub-district) of the health system in Kenya, Nigeria and South Africa (SA). In #HPSR vernacular the action-learning approach has proved to be one way of bridging the gap between research and practice, more so through working together with practitioners to build the health system. 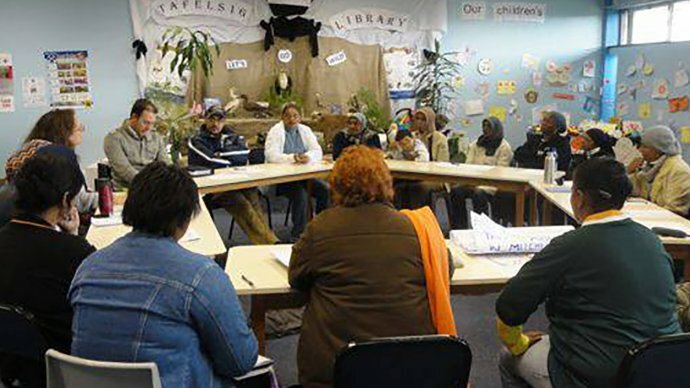 A good example of this is RESYST’s Cape Town site SA, which is an extension of the District Innovation and Action Learning for Health System (DIAHLS)project – a collaborative partnership between universities and health sites focused on strengthening governance in Primary Health Care (PHC). In fact, the Centre for Health Policy (CHP) labelled its component of the project in SA: “Siyaqinisa” an isiZulu term - ‘We strengthen together’. This has profound meaning, considering the journey from conducting interviews, researcher reflective meetings, ongoing meetings with the district director and eventually culminating into an established partnership between researchers and district staff. As linear as the process sounds, the reality is that action-learning is difficult to explain to stakeholders (funders, study participants), especially if a definite intervention isn’t carved out at the beginning of a project but rather dependent on context, challenges and establishing collaborative approach to developing any interventions. The uncertainly also overwhelms researchers as to whether they are on the correct path or not, or the stress of meeting funding requirements or to start writing up the work as academic publications. Though I recall the advice of one of our project’s heads, Professor Lucy Gilson, which set us onto the right path, ‘It’s important to just hang out, go with the flow and establish relationships, it’s important to work together with participants’. Another barrier is that relationships are difficult to foster, especially in contexts where practitioners feel their setting has been ‘over researched’ and are sceptical of yet another research interview. However, as with everyday relationships, the learning project has to start somewhere. In-depth interviews as a starting point were extremely valuable in initiating contact and nurturing long-lasting relationships. Another technique which I found useful in solidifying relationships and allowing for in-depth two-way learning was the use of an ethnographic research approach- I literally began to understand district jargon, functions, processes and would go as far to say I was mentored by those at a district level to perhaps one day even hold a finance post. Commencing with non-participant observations assisted in understanding the district and its functions as well as understanding power, dynamics and relationships. I’d describe the turning point as being asked to intervene (participant observation) in certain situations or provide advice aka bridging the gap between researchers and practitioners. Some of the aforementioned steps, culminated into exciting brainstorming sessions around challenges and solutions with district staff, of which tangible impacts may be difficult to see in comparison to the Randomised Control Trial (RCT) ‘gold standards’, although district staff began to note the value of the action-learning approach and having researchers as a support structure to deal with constraints. Brainstorming sessions were rich and geared towards finding solutions to challenges practitioners felt were important. Having an organisational psychologist (Alison Du Toit) has been one of the greatest learning curves in facilitating brainstorming sessions and really points to the need for drawing on a multi-disciplinary focus in bridging the realms of research and practice. This raises debate around whether ‘high impact’ research is required or whether a more holistic sustained approach i.e. being an action learning enthusiast in #HPSR should take precedence and should we change from being outcome focused to emergent and contextual focused, with small sustained changes through methods such as action-learning which can certainly result in big gains towards strengthening health systems?